That’s Jack Frost, North (or Santa Claus), Bunnymund (or the Easter Bunny) and the Tooth Fairy joining forces to combat an evil adversary named Pitch in the upcoming animated adventure. It’s odd that the cast doesn’t have clearance to use the actual names. That’s clearly Santa, though, so kids will have to roll with it. William Joyce wrote the book on which Guardians is based. The characters will be voiced by Chris Pine (Jack Frost), Alec Baldwin (North), Hugh Jackman (Bunnymund), Isla Fisher (Tooth Fairy) and Jude Law (Pitch). So it’s the holiday answer to The Avengers, with mythical fairy tale heroes banding together and using their unique powers to prevent a villain from prevailing and ruining everyone’s fun. That has so much potential. I only hope director Peter Ramsey, who was head of story on Monsters vs. Aliens, maximizes the full strength of the story. 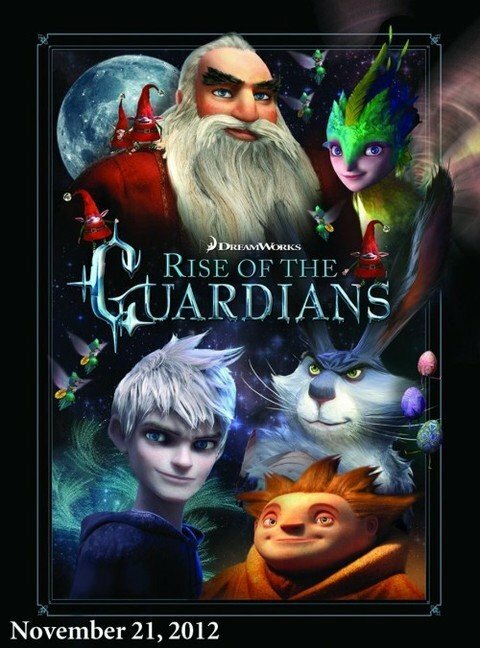 Right now, Rise of the Guardians wisely targets the Thanksgiving holiday (a Nov. 21 release date), when kids will be begging their parents to take them to the movies. This could be a massive hit.